Think Something – Anything – But Market! This is an antique Drunkard’s Path quilt I found on Pinterest. It’s pink. It’s pretty. It’s in! I think you can guess that given a choice of subjects for today, I’ll go with the first one. It’s October and since 1985, it’s been celebrated as Breast Cancer Awareness Month. But did you know that the pink ribbon symbol didn’t come until several years later? In the fall of 1991, The Susan G. Komen Foundation had given out pink ribbons to participants in it’s New York City Race for the Cure. Two years later, Evelyn Lauder of Estee Lauder Companies founded The Breast Cancer Research Foundation and established the pink ribbon as it’s symbol. If you watched any National Football Games over the weekend, you probably saw lots and lots of pink. We were laughing about that this morning and that led us to asking how much “pink” we had in the office – meaning in the sample room and notions building. 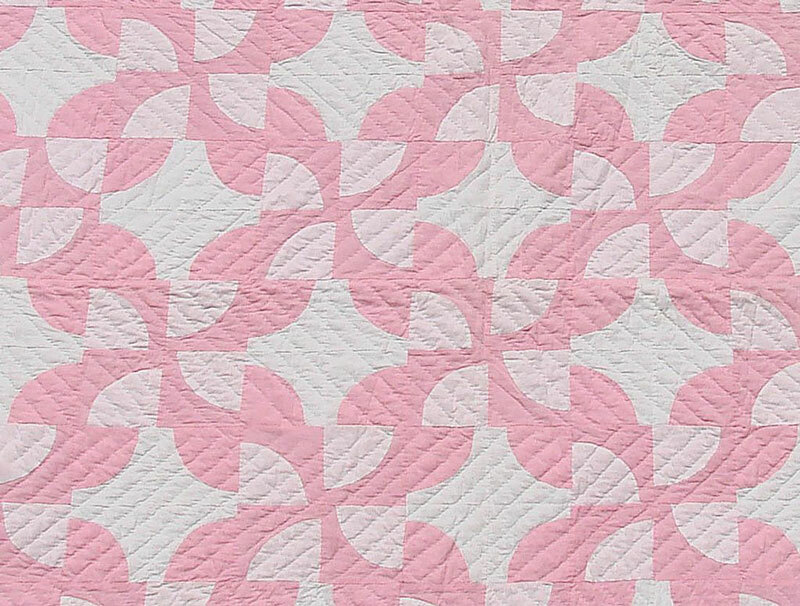 There is some pink fabric – but pictures of pink Bella Solids didn’t seem as interesting as notions. Sewline. 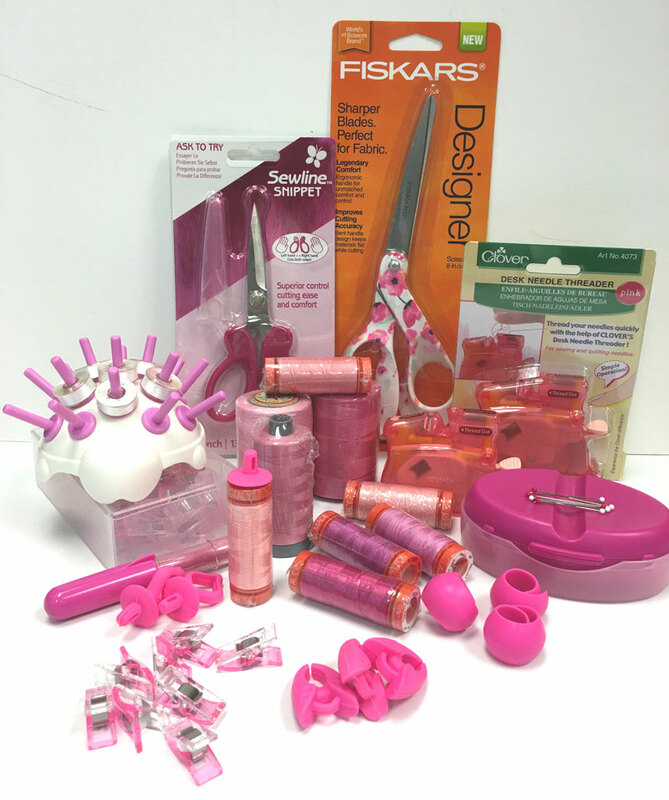 They’re easy – everything they do comes in pink packaging. 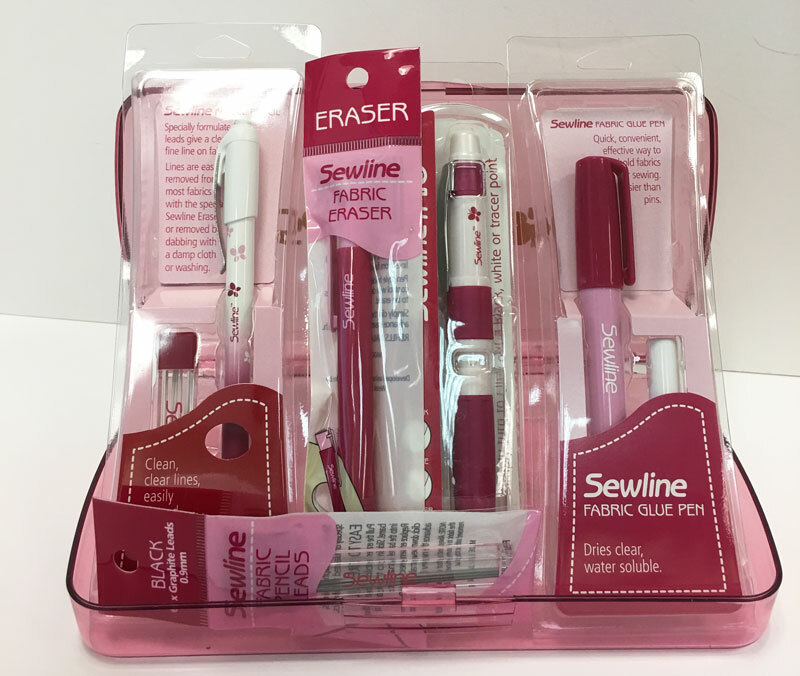 Thank you, Sewline! There were a lot – more than I would have thought. Just so you know, the Peels, Tulips and Bobbinis only come in packages with blue, green, orange and pink. I just pulled out the pink ones. I know. It says it’s a Simple Seam Wheel. They used to be pretty common in quilt shops… back in the day when templates were used for piecing a lot. They’re not so easily found now but Jen Kingwell uses them all the time so she found a source and now sells them. They’re very nice – heavy, thick and with a big enough hole for most pencils to fit into easily. These are from Millefiori Quilts by Willyne Hammerstein. 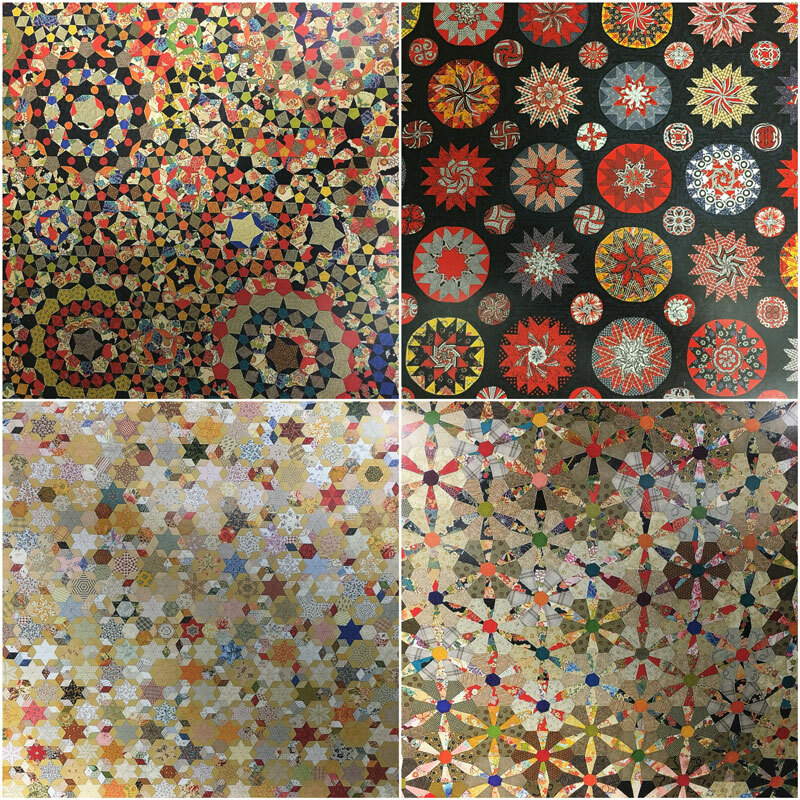 The quilt in the upper left corner is the La Passacaglia quilt – fussy cutting required, templates required. There’s also a gorgeous Millefiori Quilts 2 book… that Willyne is a busy girl. That’s enough fun for me… I’ve got a binding to finish for Karen and some log cabin strips to cut. And a backing to piece. Pink is good but I need to think about that middle thing now. Nothing I can think of for market-just had to comment that I love your posts. Had never heard of a seam wheel. How about a permanent pen for hand writing quilt labels? One that can take multiple washings and won’t fade, blur, or just disappear altogether. I’ve not had good success with Micron or Sharpie. Thanks! A seam wheel? Something else totally new (to me)….I love learning what I don’t know. It’s fun. Re: market – dying to see quilt fabric and design trends, and the actual quilting trends (particularly those done on home machines)…hope you enjoy market – if things go according to plan, I will be there for the Fall 2016 market!!!! Can’t wait!!!! I love the idea of a seam wheel, that would make hand sewing so much easier! I have a Seam Wheel. I will admit it’s been many, many years since I used it but my first quilt teacher was insist we knew how to use templates as well as rotary cutters. As for market I just enjoy all the photos of new fabrics, quilts and other projects. And all the folks too! Going to miss Market this year. Boo Hoo! If you notice any trends – color-wise or pattern-wise – let us know. Also, I’ve noticed rulers being used for home FMQ’ing. Would love to see if they’re being demo’d or how many booths are demo’g them. Would be nice if LQS’s started carryig them. Hand dyed fabrics have been big for awhile. Are they still news at Market? Thanks so much and have a great time Lucky Girl! I have a seam wheel from back in the day. I wonder if I can find it? Where oh where can you purchase one of those seam wheels?????????????? Hi Janan! 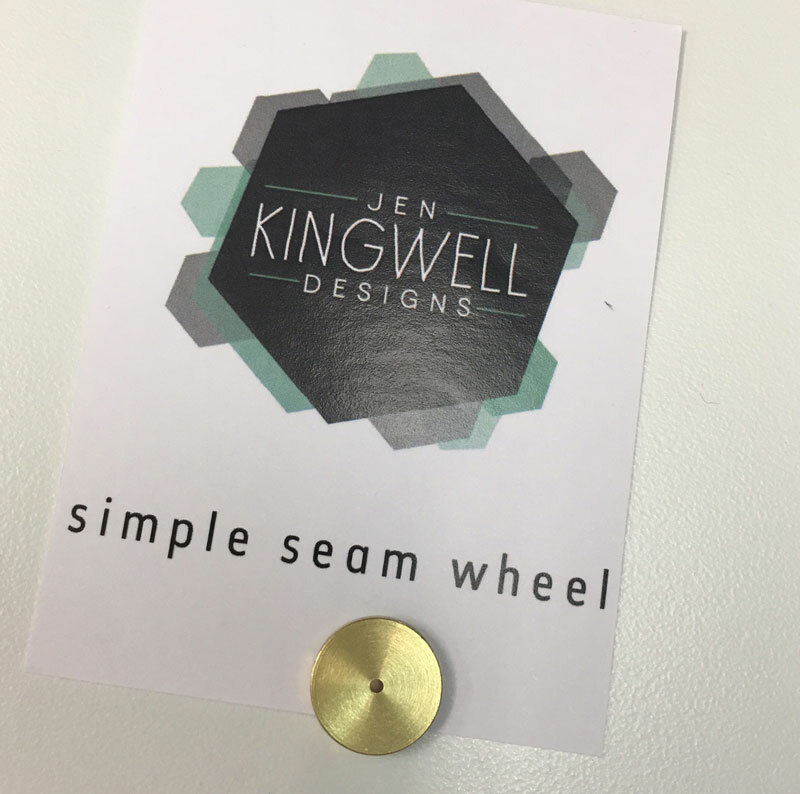 Jen’s Simple Seam Wheel is available in many online quilt shops (a Google search showed a couple of Etsy shops have it in stock, as well as two U.S. shops with websites) and hopefully, it will be in a quilt shop near you soon. Until then, it can be ordered from Jen in Australia at Amitie Quilts – http://www.amitie.com.au. Good luck!